Fixed Readers – Fixed readers are generally two-port, four-port, or eight-port, high-performance readers. These readers are the ‘workhorses’ in the industry because they provide high power and receive sensitivity to non-mobile applications. Integrated readers are a subset of fixed readers and are unique because they are a reader and antenna combined into one unit. Integrated readers may have one additional port, are usually non-mobile, and are medium- to high-performance readers depending on the specific unit. Battery – Generally specific to mobile readers, batteries provide power while allowing the reader to be cordless and mobile. Batteries are very convenient but they still must be charged, usually after a several hours of continuous use. A best practice is to have spare batteries along with a charging station that can charge multiple batteries at once. Wi-Fi –Connecting to a network or a host computer can be done via Wi-Fi for applications in a setting with a strong Wi-Fi connection. Wi-Fi connectivity provides a cordless, flexible option for RFID solutions. Wi-Fi and LAN ports are generally the only options if the application needs to be connected to a network. 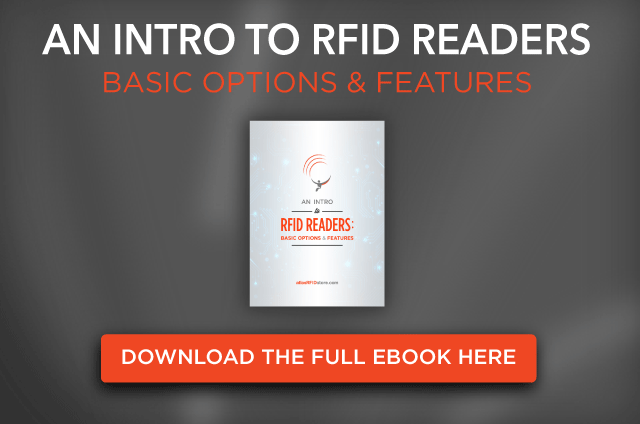 An additional advantage to an RFID reader on a network is the ability to connect a printer or other smart device to the reader. Bluetooth – Bluetooth allows the reader to connect to a host computer while remaining wireless. Bluetooth options are generally available on handhelds – especially sleds – for connecting to smart devices like phones and tablets. Mobile/Handheld Readers – Typical mobile/handheld readers have one integrated antenna and no additional antenna ports. Multiplexers – Multiplexers, also called antenna hubs, can be used in conjunction with RFID readers to increase the amount of antennas able to connect to a single reader. With certain configurations, a single four-port fixed reader can connect to up to 32 antennas. Of note, most multiplexers are only designated for use with very specific RFID readers. Each manufacturer has its own API, so it is important to investigate which API may be the best fit for a specific development environment. If assistance is required to gain access to a particular manufacturer’s API, please contact us to see if we can assist. If you have any additional questions about if RFID is right for your application, or about reader features & options, don’t hesitate to contact us.